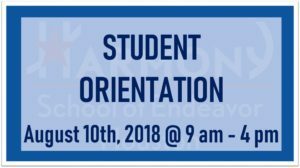 HS–Endeavor will have Student Orientation on Friday, August 10, 2018, @ 9 AM-4 PM. During orientation, parents will be able to purchase uniforms, submit any missing documents, update personal information, complete medical records, and lunch forms as wells as receive information on school policies/procedures. Only checks, money orders or credit card payments will be accepted.